Sure, summer is behind us and temperatures are starting to drop. 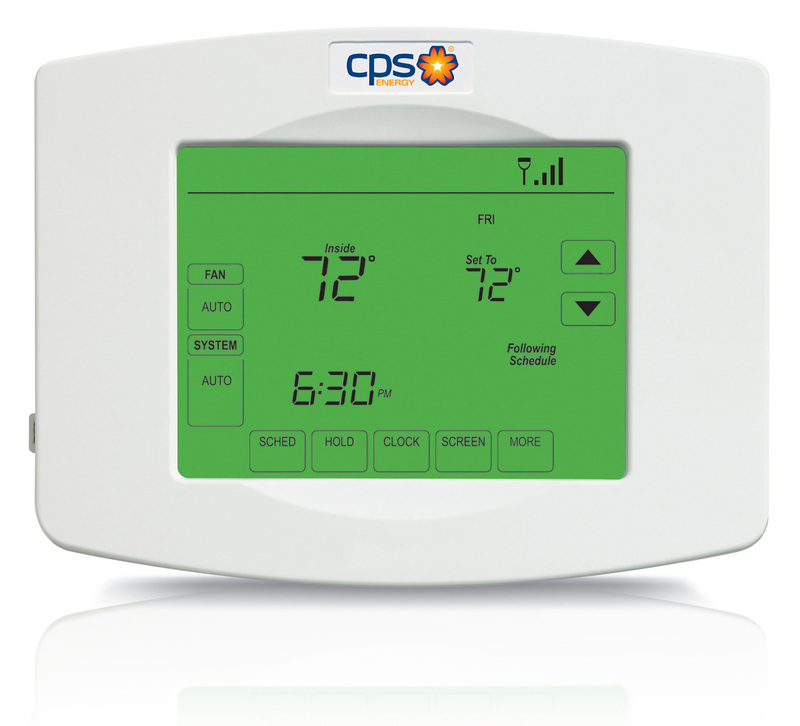 But you can still save energy and lower your monthly bill with a free, yes FREE, Smart Thermostat from CPS Energy. Smart Thermostat is a wi-fi programmable thermostat from Honeywell. You can access the thermostat and change the temperature in your home at anytime, from anywhere, using your computer, laptop, smart phone — any Internet enabled devide will do. There’s even a new smart phone app for even more convenient control of your Smart Thermostat. For example, you can program your thermostat to allow your home to get a few degrees warmer in the summer, or a few degrees cooler in the winter, while you’re at work, and then automatically return to the temperature you’re most comfortable with before you get home. While you’re getting a good deal, so are we. When you use the Smart Thermostat, you help us save energy on hot summer days when energy use is at its highest. Through the Smart Thermostat program, you agree to let us cycle your central air conditioner compressor off for a short period of time, between May and September, on the handful of days when energy demand is at its peak. Cycling will only happen for a few minutes of each hour during those afternoons, and only on weekdays, never weekends or holidays. You don’t need to worry about installing your new Smart Thermostat, either — we’ll take care of that. You can apply online, print an application and mail it, or call us toll-free at (866) 222-7645. I moved into this 1700 sf house 5 mos ago.. inspector mentioned the radio thermostat that was already installed ..so do I already have a wi fi kind of thermot?.. also am I able to exercise the control( Samsung,g5 ph) cps spoke about.. do I need to buy cps energy smart thermostat..